AMOREPACIFICTREATMENT TONER Alcohol-Free Freshener, 3.4 oz. Restore balance to your skin with this alcohol-free toner. Water-free/alcohol-free toner completes the cleansing process. Restores pH balance to make skin more receptive to the treatments that follow. For sensitive, dry, and normal skin. Unique water-free formula utilizes the revitalizing properties of Red Ginseng Extract to enliven the complexion. Arnica and Yarrow extracts lend gentle soothing benefits. After cleansing, saturate cotton ball and sweep over face, neck, and décolleté. 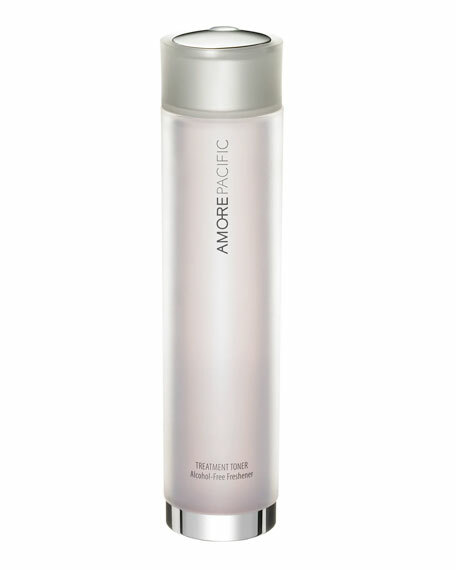 Treatment Cleansing Foam, to cleanse. Intensive Vitalizing Eye Complex, to nourish and rejuvenate the eye area. MOISTURE BOUND Vitalizing Crème, to moisturize. Erno Laszlo Sensitive Cleansing Bar, 3.4 oz.